Official figures have confirmed the dramatic jobs growth for Bedford Borough that has taken place under Mayor Dave Hodgson. Mayor Dave came to office in October 2009 pledging to make jobs a key priority, and the latest figures from the Office for National Statistics show that the Borough's jobs growth has massively outstripped both the regional and national rate since then. Mayor Dave has retained the Economic Development portfolio throughout his time as Mayor. 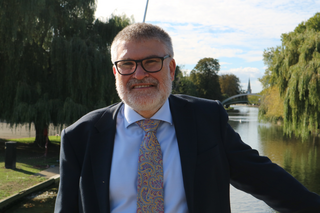 He has overseen a string of major investment successes, with employers across sectors including manufacturing and retail attracted to Bedford Borough for the first time. Big names committing to Bedford during this period have included Waitrose, which opened its first Bedford store, and B&M, which will employ 1,000 people at its new logistics centre at Wixams. Commenting, Mayor Dave Hodgson said: "Ensuring people have opportunities to live and work locally is absolutely critical. That's why I've made fighting for jobs, infrastructure and investment a clear priority for the council. While the figures show the progress made, this is an ongoing task and I'll keep working to bring new jobs to Bedford Borough."